Reading and share top 17 famous quotes and sayings about The Mind Of Christ by famous authors and people. Browse top 17 famous quotes and sayings about The Mind Of Christ by most favorite authors. 1. "The work of Christ on the cross did not influence God to love us, did not increase that love by one degree, did not open any fount of grace or mercy in His heart. He had loved us from old eternity and needed nothing to stimulate that love. The cross is not responsible for God's love; rather it was His love which conceived the cross as the one method by which we could be saved. God felt no different toward us after Christ had died for us, for in the mind of God Christ had already died before the foundation of the world. God never saw us except through atonement. The human race could not have existed one day in its fallen state had not Christ spread His mantle of atonement over it. And this He did in eternal purpose long ages before they led Him out to die on the hill above Jerusalem. All God's dealings with man have been conditioned upon the cross." 2. "The result of my journey was to bring a certain mental peace. Where there had been chaos there was now order. My mind was at rest. I had a philosophy at last. The words of Christ "The Kingdom of Heaven is within you," had a new meaning for me. Not in the past or in the future, but now and here is Heaven within us. All our duties lie in this world and in the present, and trying impatiently to peer into that which lies beyond is as vain as fruitless." 3. "Art, if it can be ascribed value, is most valuable when its beauty (and the beauty of the truth it tells) bewilders, confounds, defies evil itself; it does so by making what has been unmade; it subverts the spirit of the age; it mends the heart by whispering mysteries the mind alone can't fathom; it fulfills its highest calling when into all the clamor of Hell it tells the unbearable, beautiful, truth that Christ has died, Christ is risen, and Christ will come again. None of these songs and stories matter if the beauty they're adding to isn't the kind of beauty that redeems and reclaims." 4. "She left her water pot because she had now found a well of 'living water.' She had come to the well for literal water and that was what her mind was set on. But now that she had obtained salvation, she did not think any more about her water pot. It is always this way. Once our souls truly perceive Christ, once we know Him and receive Him as our personal Savior, we turn away from what we used to think about. Her mind was now fixed on Christ, and she had no thought of well, water, or water pot." Granted, even after we come to Christ and learn to drink of His living water, there can be a time when we must learn how to leave the other "water behind" and it is certainly not always an instantaneous exchange of water, like the woman at the well did. We are not saying that it always has to happen in this manner, but what we are saying is that as we drink of Christ's living water we are able to leave behind the sinful water." 5. "Now, the atonement of Christ is the most basic and fundamental doctrine of the gospel, and it is the least understood of all our revealed truths.Many of us have a superficial knowledge and rely upon the Lord and his goodness to see us through the trials and perils of life.But if we are to have faith like Enoch and Elijah we must believe what they believed, know what they knew, and live as they lived.May I invite you to join with me in gaining a sound and sure knowledge of the Atonement.We must cast aside the philosophies of men and the wisdom of the wise and hearken to that Spirit which is given to us to guide us into all truth.We must search the scriptures, accepting them as the mind and will and voice of the Lord and the very power of God unto salvation.As we read, ponder, and pray, there will come into our minds a view of the three gardens of God—the Garden of Eden, the Garden of Gethsemane, and the Garden of the Empty Tomb where Jesus appeared to Mary Magdalene." 6. "We do not know, we cannot tell, no mortal mind can conceive the full import of what Christ did in Gethsemane." 7. "I was a witness of the execution at Horsemonger-lane this morning. ... I believe that a sight so inconceivably awful as the wickedness and levity of the immense crowd collected at that execution this morning could be imagined by no man, and could be presented in no heathen land under the sun. The horrors of the gibbet and of the crime which brought the wretched murderers to it, faded in my mind before the atrocious bearing, looks and language, of the assembled spectators. ... When the two miserable creatures who attracted all this ghastly sight about them were turned quivering into the air, there was no more emotion, no more pity, no more thought that two immortal souls had gone to judgment, no more restraint in any of the previous obscenities, than if the name of Christ had never been heard in this world, and there were no belief among men but that they perished like beasts." 8. "The first fruit of love is the musing of the mind on God. He who is in love, his thoughts are ever upon the object. He who loves God is ravished and transported with the contemplation of God. "When I awake, I am still with thee" (Psalm 139:18). The thoughts are as travelers in the mind. David's thoughts kept heaven-road. "I am still with Thee." God is the treasure, and where the treasure is, there is the heart. By this we may test our love to God. What are our thoughts most upon? Can we say we are ravished with delight when we think on God? Have our thoughts got wings? Are they fled aloft? Do we contemplate Christ and glory?... A sinner crowds God out of his thoughts. He never thinks of God, unless with horror, as the prisoner thinks of the judge." 9. "In confession occurs the breakthrough of the Cross. The root of all sin is pride, superbia. I want to be my own law, I have a right to my self, my hatred and my desires, my life and my death. The mind and flesh of man are set on fire by pride; for it is precisely in his wickedness that man wants to be as God. Confession in the presence of a brother is the profoundest kind of humiliation. It hurts, it cuts a man down, it is a dreadful blow to pride...In the deep mental and physical pain of humiliation before a brother - which means, before God - we experience the Cross of Jesus as our rescue and salvation. The old man dies, but it is God who has conquered him. Now we share in the resurrection of Christ and eternal life." 10. "When a man comes under the blood of Christ, his whole capacity as a man is refashioned. His soul is saved, yes, but so are his mind and his body. True spirituality means the lordship of Christ over the total man." 11. "O sit and wait for joy to arrive without turning your mind to the things of Christ is like expecting the Holy Spirit to take 15 pounds off your body while sitting on the couch eating ice cream (p. 57)." 12. "Men have a great deal of pleasure in human knowledge, in studies of natural things; but this is nothing to that joy which arises from divine light shining into the soul. This spiritual light is the dawning of the light of glory in the heart. There is nothing so powerful as this to support persons in affliction, and to give the mind peace and brightness in this stormy and dark world. This knowledge will wean from the world, and raise the inclination to heavenly things. It will turn the heart to God as the fountain of good, and to choose him for the only portion. 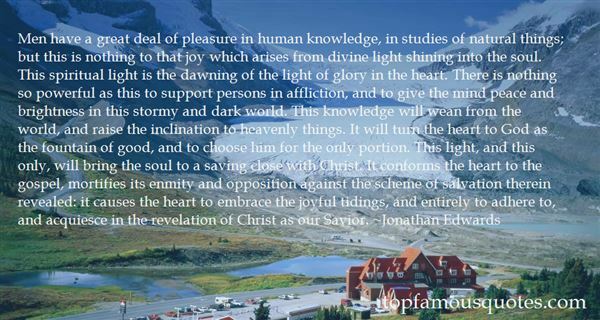 This light, and this only, will bring the soul to a saving close with Christ. It conforms the heart to the gospel, mortifies its enmity and opposition against the scheme of salvation therein revealed: it causes the heart to embrace the joyful tidings, and entirely to adhere to, and acquiesce in the revelation of Christ as our Savior." 13. "Faith is unlearning this senseless worries and misguided beliefs that keep us captive. It is far more complex than simply modifying behavior. Faith is rewiring the human brain. 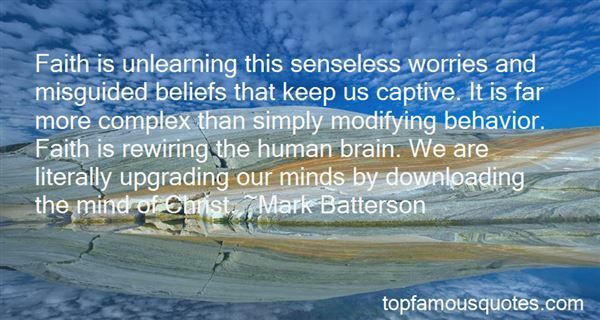 We are literally upgrading our minds by downloading the mind of Christ." 14. "The law of gravity and gravity itself did not exist before Isaac Newton." ...and what that means is that that law of gravity exists nowhere except in people's heads! It 's a ghost! "Mind has no matter or energy but they can't escape its predominance over everything they do. Logic exists in the mind. numbers exist only in the mind. I don't get upset when scientists say that ghosts exist in the mind. it's that only that gets me. science is only in your mind too, it's just that that doesn't make it bad. or ghosts either. "Laws of nature are human inventions, like ghosts. 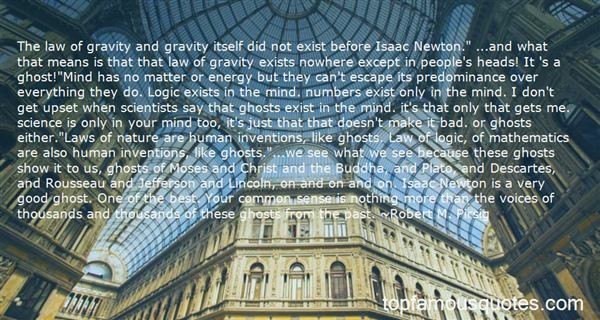 Law of logic, of mathematics are also human inventions, like ghosts. "...we see what we see because these ghosts show it to us, ghosts of Moses and Christ and the Buddha, and Plato, and Descartes, and Rousseau and Jefferson and Lincoln, on and on and on. Isaac Newton is a very good ghost. One of the best. Your common sense is nothing more than the voices of thousands and thousands of these ghosts from the past." 15. "Religiously, we longed for the lively life in Christ, but we did not fully see that we were equally longing for the lively life of the mind - the delights of conversation at once serious and gay, which is, whatever its subject, Christ or poetry or history, the ultimately civilized thing." 16. "The knowledge of our union with Christ...gives us confidence in prayer. It was when Jesus had begun to expound the closeness of this union that he also began to introduce the disciples to the true heart of prayer. If Christ abides in us and we abide in him, as his word dwells in us, and we pray in his name, that God hears us (Jn 15:4-7). But all of these expressions are simply extensions of the one fundamental idea: If I am united to Christ, then all that is his is mine. So long as my heart, will and mind are one with Christ's in his word, I can approach God with the humble confidence that my prayers will be heard and answered." 17. "Submissive Mind (Phil. 2). This chapter focuses on people, and the key verse says, "Let nothing be done through strife or vainglory; but in lowliness of mind let each esteem other better [more important] than themselves" (v. 3). In chapter 1, Paul puts Christ first. In this chapter, he puts others second. Which means he puts himself last! The reason people aggravate us so much is usually because we do not have our own way. If we go through life putting ourselves first, and others go through life putting themselves first, then at many points there are going to be terrific battles." Like many human beings, he took the least sign of conversation as his cue to make noise."